Two-factor authentication adds security to your account by requiring an additional security code at login. This code is only accessible via a free application called Authenticator installed on your mobile device. Even if an attacker guesses the password to your account, they will be unable to log in without physical access to your phone or tablet. Log in to Porkbun. Click on your username in the top-right of your browser window and select Account Settings. Locate the "Two Factor Authentication" section near the bottom of the page. Open Authenticator and add a new profile. In Google Authenticator, this is done by tapping the red + symbol and selecting "Scan a barcode." Holding your mobile device up, point its camera at your browser window and scan the barcode. 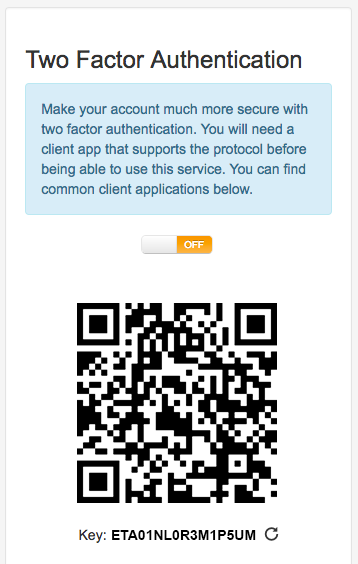 A Porkbun profile will appear in Authenticator showing your current six-digit two-factor authentication code. Click the orange OFF switch to activate two-factor authentication. A window will appear: Enter the six-digit code from Authenticator into the box and hit Submit. The orange OFF switch will turn to green ON indicating that two-factor authentication is now activated! From now on, whenever you log in, you'll be asked for your six-digit code from Authenticator. Remember to re-download and configure Authenticator when you switch to a new mobile device. Please note that after logging in with two-factor authentication, you will not be required to enter your two-factor code for up to one hour if you use the same browser window. To disable this behavior, always log in using private browsing / incognito mode.